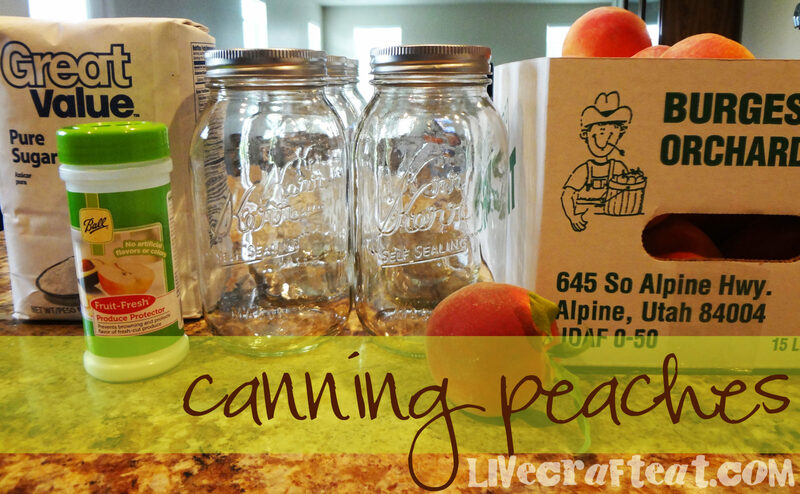 one of my favorite back-to-school memories include canning peaches the entire day before school started. i love the assembly-line process, the way the skins peel off the peaches, and, of course, eating them! my mom always canned her peaches without making a syrup ahead of time. instead, she put the sugar and water in with the peach slices and through the canning process, they made their own syrup. less mess and less work! 1. boil peaches in water for about 30 seconds. place them immediately into a bowl or sink full of cold water. (this stops the peaches from cooking and makes them easier to handle.) the reason you boil the peaches for a few seconds at the beginning is because it makes it infinitely easier to remove the skins – they literally just slip right off! 2. peel and slice (or halve) peaches. place peach slices in a clean glass jar, about half way. be sure to eat some of the peach slices as you’re putting them in the jar – this is my favorite way to eat peaches! this entire step is the best one for kids who are wanting to help out! 3. pour 1/3 – 1/2 cup sugar in the jar, along with 1 teaspoon fruit fresh to help the peaches maintain their color. 4. fill the jar the rest of the way with peaches – up to the shoulders of the jar. 5. fill the jar up to the shoulders with water. use a knife and run it down the inside edges of the jar to release any major air bubbles. 6. clean off the top of the jar with a clean towel (anything on the top of the jar will prevent it from sealing properly). 7. put on a lid and screw on the metal ring tightly. 8. can according to your preferred method of canning. easy! what a great and satisfying way of enjoying peaches year-round!